I just don’t have time to pray. I can never get a moment to myself. I can’t even go to the bathroom in peace. I have to wake up early for work. When I get home, I have to prepare dinner. Then I do homework with the kids. Unfortunately, by the end of the night my brain is fried. We know all too well the struggle of balancing family and work life. Trying to do our best to get time in with our spouse, time for ourselves and time with God. Unfortunately, most people will go out of their way to prioritize their time with people they can see, but what about prioritizing time with God? If this is you, don’t feel bad. God does not care where or how you commune with Him. He just wants His time with you. If you have a long commute and can’t seem to wake up early enough to pray or stay up a little later, then consider using your time in the car as a way to commune with God privately. 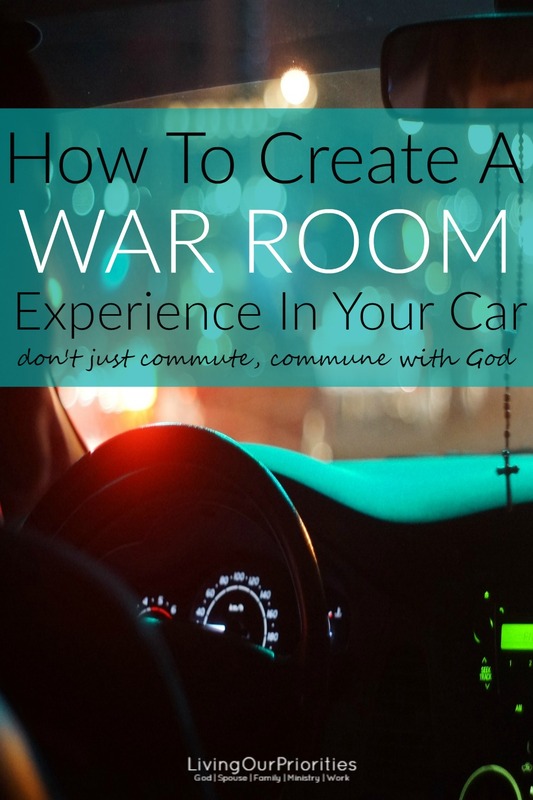 As a result, you will discover that you have just created a war room experience. It will only take a willing heart and a few steps to set it up. When the space around you is cluttered it’s hard to commune with God, or even think properly. It’s so much easier to commune with God when your environment, your heart, and your mind are at peace. When we wrote about why you need to create a war room, we talked about having a diffuser or some sort of fragrance in your room. The fragrance begins to work by calming your mind and body. Similar to walking into a spa, and this concept is the same for your car. When your car is cleaned, and smells good it immediately helps your mind and body to be at ease. You can use a car tree, car diffuser, or any other car deodorizer you like. Having a clean, fresh smelling car will even make your commute nicer. Typically in our war room at home, we don’t listen to worship music. Because we don’t want to be distracted. However, when we’re driving, worship music can help you stay in a place of peace. Especially, with all the road rage that is out there today. If you are rushing with the kids, or running late to work, you might need a few minutes of worship to calm you down and get your heart in the right place to pray. And thankfully there are a variety of resources available to help you do this. You can create a play list on your phone, play your favorite worship CD, or use any of the online music streaming stations. Personally, we use Pandora, and Spotify so we can set up stations for the mood we are in. When we are in a place of being still before the Lord, we have a Worship station that plays slow worship songs. On the other hand, when we feel like putting a whooping on the devil, we play a station we with gospel jams. Whatever music brings your heart peace, is what you want to use to help lead you in the spirit of prayer. Last but not least be sure to keep some Kleenex in your glove compartment. The tears come rolling down, when you get deep with God. It’s amazing how we get overwhelmed with emotion when the Holy Spirit starts working on us. Isn’t it? Our commute doesn’t have to be daunting. We don’t always have to be on the phone. We can however, choose to turn our commute into quality time with God. Hit traffic? NO worries, that delay just allows you more time to talk to God and an opportunity for your heart to be still and hear His voice. Let’s face it; our lives are filled with too much to do, and very little time. So why not use our time wisely and do the best with what we have? You may have to get up early and drive a long commute to and from work, but instead of complaining about it, why not pray through it? “Rejoice evermore. Pray without ceasing. PS…Below are a few items to start with in your car. You can also SHOP NOW for prayer resources at DaySpring.com. I just wanted to reach out and say thank you. It is wonderful seeing your site here. May God continue to bless you both and your entire family! This took me back to my graduate school years when I would commute 1.5 hours. Those were the best times of intimacy with God. Thanks for sharing. Love, love, love this! My car is a hot mess right now and that’s going to change this week. I am totally going to take advantage of my time alone in my car. I always and only listen to a local contemporary Christian radio station and rock out, worshiping while I drive. What a great opportunity to use that time in prayer and quiet conversations with God. Thank you so much for this wonderful idea.